Age : Unknown but host mind is 28 years old. Humanoid form : Subject appears to be a male Caucasian with blond hair and blue eyes. Status : Active member of the US and Canadian ACTF. Description: Subject was originally a human named Scot Matthew, an Advance Technology Engineer of the US anti-Chronos resistance R&D lab in Washington DC. The subject was working on a top secret project when his mind was accidentally merged with a prototype Green Armour during an attack on the main US anti-Chronos base in Washington DC, which marked the first official appearance of Cyber Guyver and Female Guyver 2. The consequence of this attack left Cyber Guyver seriously damaged. The Cyber Guyver then tried to absorb the prototype Green armour for the resources he needed to regenerate, unaware that the mind of Scot Matthew was now within its artificial shell, but was stopped by Dr. Drake. Consequently, the interrupted regeneration process resulted in the mind transfer between Cyber Guyver and Scot Matthew. 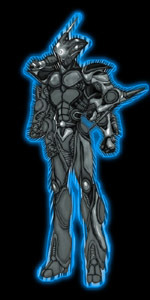 Now as Cyber Guyver Dark, Scot Matthew has become a powerful member of the ACTF. Present estimates of New Guyver type abilities have been compiled and summarized below. -Physical strength varies according to units power levels. Initially this caused subject to average that of a normal Guyver with peak recorded high equal to a twice that of a Guyver when he tapped external energy source(s). The subject has since assimilated a dimensional coupler, allowing him to constantly maintain his maximum power level as long as he doesn’t over drain his energy reserves. The subject has also acquired the ability to take on a Gigantic Guyver like form, with its own dimensional coupler, that allows him to easily double his strength and power. -Durability: Units physical composition appears to be a mass of nano-machines that gives the subject approximately the same range of regenerative ability as a normal Guyver but with the augmented ability to absorb surrounding inorganic matter, preferably cybernetic based materials, to accelerate the regeneration process to up ten times normal and is limited only by Units power reserves and available material that can be absorbed but the durability of the armour, in general, is roughly equal to that of a normal Guyver unit, but is further supplemented by subjects E.M. based powers that allow him to create energy shields similar to that used by the Zoalord Purg’stall. Subjects Gigantic form supplements this even further by generating a secondary shield similar to that used by standard Gigantic Guyvers. Allowing subject to easily withstand a standard Guyvers full double mega smash for at least one direct hit at a time. -Speed of unit, like most of its abilities, is determined by units power levels at any point in time, but averages that of a normal Guyver with a peak almost rivalling that of the Warrior Guyver unit. Reflex speed on the other hand is vastly superior to any Guyver type due to the computer like Brain subject possesses, allowing Subject to think and react far faster than even a Guyver enhanced human. 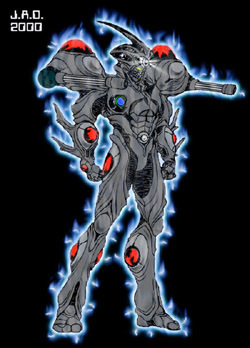 -Head infrared laser orb and sonic emitters are approximately the same in function and ability as those possessed by standard Guyver units but can be boosted in power level when subject has access to an external energy source, though subject can usually manage to fire these weapons at Gigantic Guyver power levels. In Gigantic form, these weapons are boosted by up to ten times a Guyvers norm and the subject gains two additional head beam orbs, on either side of his control medal, that have half the power of the main orb. -Vibrational Swords are the same as standard Guyver type, but subject has learned to channel his E.M. power through them for added strength and power. In subjects Gigantic form, the vibrational swords can function in the same way as a normal Gigantic and can be infused with enough energy to make them easily able to cut through normal vibrational swords. -Units Mega-Smashers are identical to those possessed by regular Guyver units but due to artificial nature of subjects body that use of the Mega-Smashers results in a severe drain on units energy reserves. This limits the Subjects use of the Mega-Smashers, the most powerful of the Guyvers weapons, to a last resort weapon unless subject has access to a substantial external energy source or has time to regenerate its reserves on its own. This limitation has been greatly reduced since subject assimilated a dimensional coupler but still remains a consideration in its use. In Gigantic form, this weapon is more than doubled in power and when subject can tap a large source of external power, he can fire a blast as powerful as a Destroyer Grakkens full quadruple hyper smash, but with a firing duration of up to 10 seconds. The downside to this powerful attack is the enormous energies needed to empower the subjects hyper smashers to that level of power can overload and destroy the subjects body, so is rarely used unless absolutely necessary. -Electro Magnetic Control Orb: The normal Guyver ability to control gravitational forces has been replaced with the ability to generate and control complex electro-magnetic fields that allow Subject to fly and create force fields, effectiveness varies according to Subjects power level but can withstand anything up to a Guyvers Mega Smashers when Subject is linked to an external energy source or is fully charged by the dimensional couple. Subject can also focus its power to produce a variety of energy weapon attacks. One type of attack generates a directional shockwaves of E.M. energy, with a one to six foot radius, though damage index varies with units power levels, and can easily rival the pressure cannon in force and destructive radius. It can be fired continuously. The subject can also focus his power to produce a pressure cannon like plasma ball attack, with the destructive power equal to a Gigantic Guyvers normal blast. This attack can also cause secondary damage to targets vulnerable to the intense heat and electrical discharge of this attack, unit can also fire lightning like bolts from hands with similar to higher damage index as the electrical discharge from a Hyper Zoanoid Elegan, depending on units power levels, but does not require physical contact and can reach targets as far as 100 meters away, and just below the units vibrational swords are plasma pulse blast emitters that can rapidly fire a short intense plasma energy pulse with a damage index equivalent to a Guyvers single handed mini-pressure cannon blast but induces the damage from intense heat rather than force. In Gigantic form, all these energy attacks can be triple in power or focused into a single massive plasma ball blast, twenty times more powerful than a normal Guyvers pressure cannon. -Unit can use nano-tech nature of its body to morph either or both of its forearms into fusion cannons. Though a short range weapon the fusion cannon has a damage index of roughly half of the units Mega Smashers but can be used repeatedly due to lesser strain on units energy reserves. In Gigantic form, this weapon easily rivals a normal Guyvers Mega Smashers in both range and power. 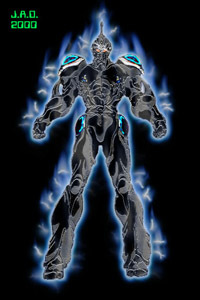 -Unit can use its computer like brain and energy manipulation ability, along with retractable cables from its forearms, to interface and control any form of computer or machinery within its vicinity and possesses sensory enhancements that allow Subject to perceive the entire electro-magnetic spectrum. The later ability allows Subject to see through most objects, allowing him to tell friend from foe and see any concealed trap, and can analyze the nature of almost any material or object within seconds. -Teleportation: First demonstrated by the original host of subjects body, essentially units combination of nano-technology and Creator made Guyver Unit has given subject the ability to access Hyper Space. This allows subject to both store objects in hyper space, such as his Gigantic armour, and to teleport. The present host of the unit has learned to activate this ability, but has found it very draining on his energy reserves unless he’s in his Gigantic form. The teleportation is also limited by range as subject excerpts an increasing amount of energy per distance teleported. So even at full power, subject can only teleport up to one A.U. before exhausting his energy reserves and forcing him to wait for his dimensional coupler power system to recharge him, though short planetary distances are much more easily handled. -Below is an image of the subject prior to having developed his Gigantic form. Subject took this form reflexively during a battle with a Destroyer Grakken, while aboard a Grakken Mothership, in order to counter the Destroyer Grakkens greater power. -Shorty after taking on the form of a Destroyer Grakken, the subject managed to absorb the Grakkens Destroyer armour and then transformed into the Gigantic form pictured below. This form enhances all the subjects powers, much like a normal Gigantic armour would. Created from a combination of a Robo Guyvers Gigantic upgrade, technology assimilated from a Grakken mothership, a Grakkens Destroyer Armour, and the subjects own nano-technology. The Gigantic Cyber Guyver unit has powers unique to this subject. Most notable of which are the replacement of the Gigantic Guyvers shoulder pod antennas with rotary electric chain gun type weapons, that fire a barrage of rail gun type projectiles that can easily tear apart any unshielded target.